The M-Series sports car was a natural progression from the popular Vixen Range that was phased out in 1973. This new range was showcased at the 1971 Earls Court Motor Show in London, and featured a new multi tube frame which was both stronger and easier to repair. The basic formula of a front mid-engine, rear wheel drive car with a backbone chassis and fibreglass body was retained from previous models. Furthermore, it had independent four wheel suspension, which used coil springs front and rear, and with components sourced mainly from Triumph. The M-Series was characterised by the combination of a single chassis and shared body style, and was the brainchild of Martin Lilley, who acquired the company in 1965. Since success in the US market was paramount, a network of 36 dealers sold TVR's throughout the Eastern States, whilst Canada was served through a single outlet. An interesting feature, during that period, was the fact that TVR was able to include a 5 year guarantee on the M-Series chassis that covered corrosion. In fact, they were able to do this by laying down a thin film of oil, during the production process, within the tubular chassis and then capping the ends. Finally, components were fastened onto the chassis without piercing the walls of the tubes, so preventing ingress of moisture. Another interesting feature was, by using a shallower radiator, the spare wheel could be positioned in front of the engine, so increasing the luggage space behind the seats whilst, at the same time, providing additional crash protection. M-Series cars were fitted with 11 inch disc brakes at the front, and 9 inch drums at the rear, as used in the Triumph TR6. Steering was by rack and pinion, and the steering gear came from British Leyland. As a result of production overlap, certain earlier models were built with pre M-Series bodies and chassis, such as the TVR 2500, the Series 4 Vixen, and the final units of the TVR 1300. In terms of body styling, the doors, roof, front windscreen, and bulkhead were retained from the Vixen that was being phased out, which meant that only the bonnet and rear section needed restyling. Early models of the M-Series sports car had vents positioned on the bonnet and front wings, although these were removed in 1975. The windscreen on these models was sourced from the Ford Consul saloon, while the rear lights were initially from the Ford Cortina Mark 2 saloon, and later from Lucas. Following the end of the M-Series, TVR transferred the rights to TVR Sportscars Ltd. The contract covered not only production, but also tooling, and many M-Series parts, together with the fibreglass body. The two seater, TVR 1600M fixed head coupe sports car was introduced in June 1972, and was powered by the Ford 1.6 litre, 4-cylinder, Kent engine, as used in the Ford Capri GT saloon. It used a Ford four speed gearbox, the brakes were servo assisted, and the differential was sourced from the Triumph TR6. It was fitted with a twin choke Webber carburettor, and had a compression ratio of 9.0:1. The engine developed 86 bhp at 5500 rpm, and 92 ft/lbs of torque at 4000 rpm, produced a top speed of 105 mph, with a 0-60 mph time of 10.4 secs. This model was initially phased out in April 1973. However, following the 1973 oil crisis in which demand for fuel efficient cars increased dramatically, it was relaunched in late 1974. By the time production finally ended in 1977, a total of 148 units of the 1600M variant were built, 68 between 1972-1973, and 80 between 1975-1977. M-Series cars were successful on the track in the UK. Of particular mention was Chris Alford, who drove a 1600M in the British ProdSports series. 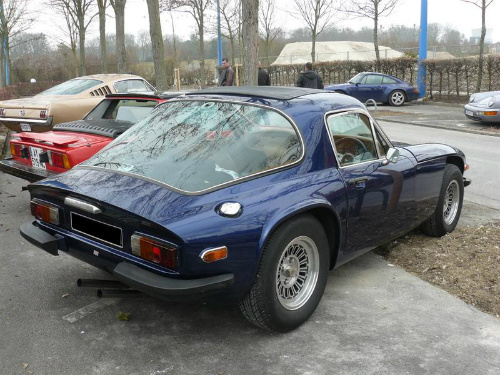 A 1972-77 TVR 1600 M in good condition would fetch in the region of £10,000/$16,000.